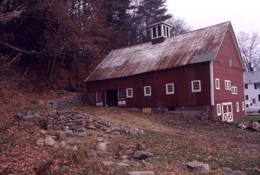 Repairs to upper half and complete reconstruction of lower half of dry stone wall retaining access road to upper level of this bank barn. Access to this barn is possible at three levels thanks to an impressive dry stone retaining wall which supports the bank gable end and is over a century old. Local stone. Click the thumbnails below to show enlarged images in a new window (turn off blocking of pop-up windows in your browser if needed).